The date was the 24TH of August the year 2014 the time was around 3 hours later than I would of liked it to be, but as I had not factored taking three children on this walk into the prep time. We were running behind schedule after an argument why a 9 year old could not bring a 5 foot long Nemo teddy on a walk after a tantrum and some word of compromise we put a woolly hat on Nemo and set off under the agreement he would guard the car while we walked. We also agreed that Nemo would not need boots. Finally on the road the day was sunny and cool with autumnal hints on the trees and hills as well drove up through Kendal towards the Longsleddale valley to start our walk over kentmere pike at a vantage point of 730 metres. Leaving the car you can start you gradual accent towards Brownhowe bottom Grid 478 085 following the track and the River up to a small bridge the track does steepen towards this but it is a short slog before it flattens out after the bridge onto a marshy plain. With some dam building on the agenda of the 9 and 10 yr olds in the small stream we stopped for a while, and wondered if Nemo was ok and if moths get headaches? But before long after building a mighty dam in the stream we were back on the trail following the path as it climbed and wound up towards Adam seat at around the 666 metre mark. It was an unforgivably cold August day and as we ascended the wind became a little bitter on the exposed paths and ridges walking up towards our lunch stop at Grid 465 097. This point on the map offers a great view with some lovely rocks to sit on, it is a little exposed and has the potential some cold winter winds if you are taking children also be mindful of the nearby Harter fell gully. 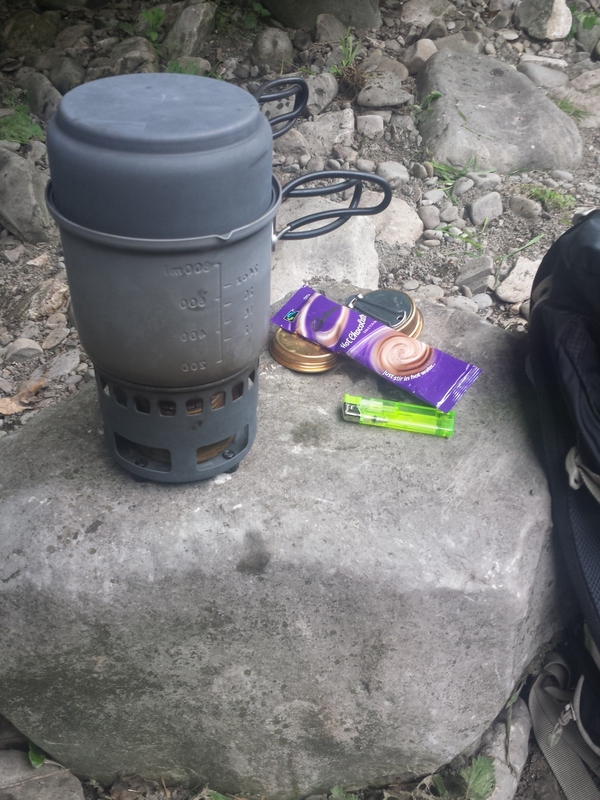 After some hot chocolate a kitkat each and butty the hot chocolate heated with my esbit stove running on bio ethanol (review to follow). 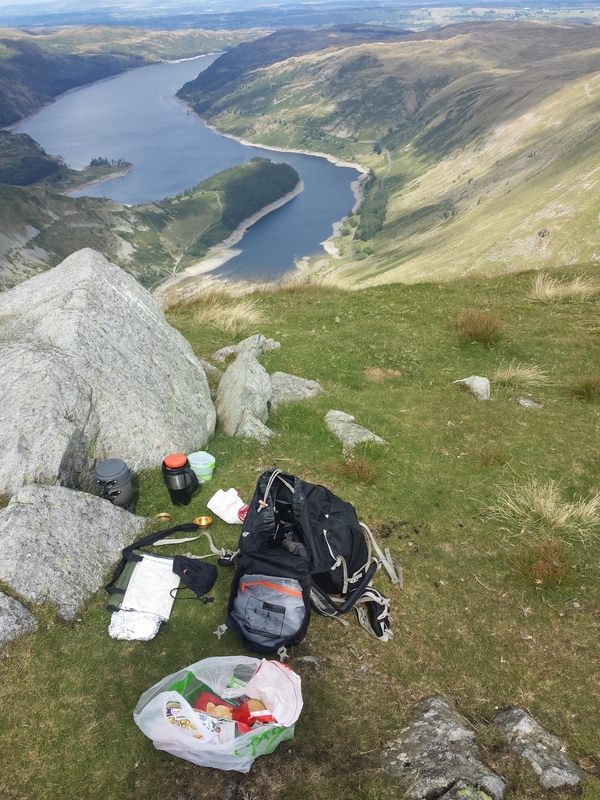 We set off up to Harter Fell along the fence line towards the large cairn at 778 metres grid 459 094 after this it does flatten out for your walk back so chill out the hard work is done. The views are nothing short of fantastic on a clear day the windfarms off the west Cumbrian shore are clearly visible. One thing to watch out for on a wet day or after few days of rain, may leave this part of the walk pretty boggy on the tops but some good boots, gaiters and some probing of the mud should keep you out of the worst of it despite this muddy section I managed to return with all 3 children I set off with and in a relatively clean state. Once at the trig point at Kentmere Pike Grid 466 078 simply follow the ridge line and fences back to the road meeting the road after Wray Crag the road is rocky and flat and often used by burly men in kitted out land rovers so if you have little ones with you bear this in mind. This path will take you back to your starting point feel free to soak your feet a little next to the bridge its very soothing. 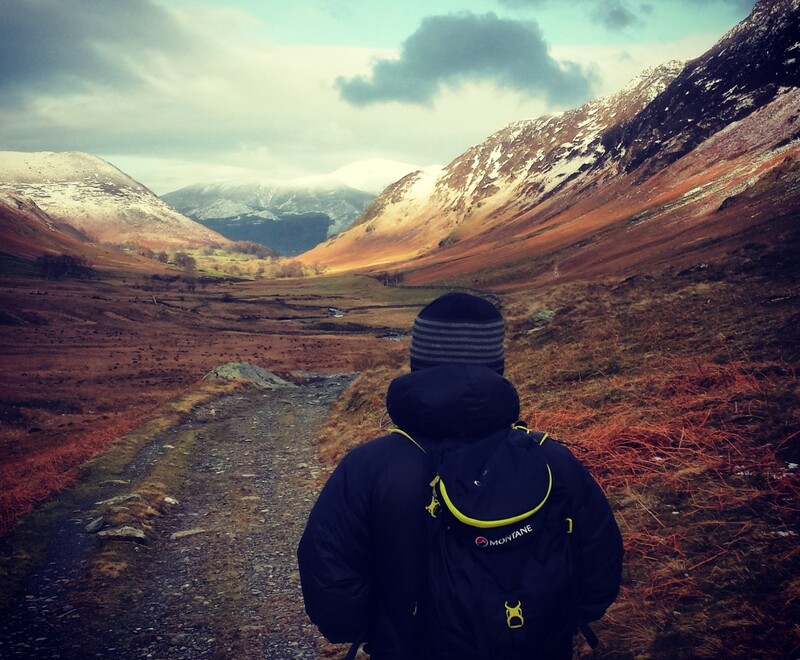 This walk is a bit of a hidden gem and has views to rival any of the other popular walks in the lakes and is child friendly with free parking. Fitness wise this should be well with most people’s grasp and as long as you can read a map with confidence and have the correct adequate kit you should be able to see this gem for yourself. Categories: Uncategorized | Tags: camping, gear, kit, trecking, walking | Permalink.